280 pages | 5 B/W Illus. Against a background of the ongoing crisis of global capitalism and the fracturing of the neoliberal project, this book provides a detailed account of the ways in which language is profoundly imbricated in the neoliberalising of the fabric of social life. With chapters from a cast list of international scholars, covering topics such as the commodification of education and language, unemployment and the governmentality of the self and discussion chapters from Monica Heller and Jackie Urla bringing the various strands together, the book ultimately helps us to understand how language is part of political economy and the everyday making and remaking of society and individuals. It provides both a theoretical framework and a significant methodological ‘tool-box’ to critically detect and understand the impact of neoliberalism on everyday social spheres, particularly in relation to language. Presenting richly empirical studies that expand our understanding of how neoliberalism as a regime of truth and as a practice of governance performs within the terrain of language, this book is an essential resource for researchers and graduate students in English language, sociolinguistics, applied linguistics, linguistic anthropology and related areas. 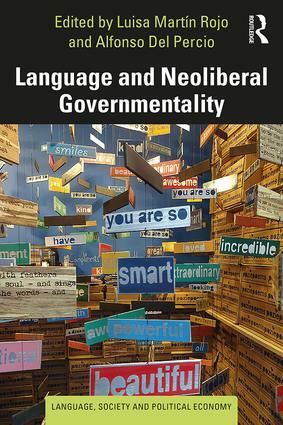 "Led by a lucid introduction that outlines the idea of governmentality, contributions to this book open up a new space for debating the role of language and subjectivity in the persistence of neoliberalism. Their critique of neoliberal rationality offers a timely reflection on how to resist and counter the logic of the market." "This book reveals the faultlines in neoliberalism which scholars can uncover when they examine the ways people use neoliberal technologies of the self to manage language use and representations of language. With an expansive approach to educational sites, this imaginative volume lays important groundwork for understanding when neoliberal logics go awry." Dr. Luisa Martín Rojo is Professor in Linguistics at the Universidad Autónoma in Madrid. Dr. Alfonso Del Percio is Lecturer in Applied Linguistics at UCL Institute of Education in London.